CRAPTASTIC: Five Feature Friday #21! Wow! I've been slacking on my FFF for awhile! Bad Katie!! How dreamy is this dresser that Decor Adventures scored for FREE!! What a beautiful makeover! Love the blue and the crystal knobs (and that rug)!! I simply love the color Fabulously Flawed painted this buffet! It goes perfect with the gold hardware! I love the details and the distressing! Ummm, yes! 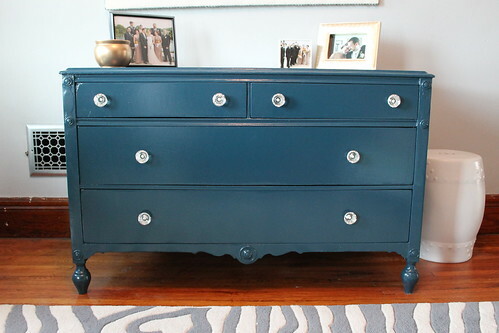 Our DIY Diaries totally rocked this dresser and made it into an awesome console! How great is that purple!! I just love the look of warm wood against darker colors like steel! Mingled Elements nailed it with this Restoration Hardware knockoff! 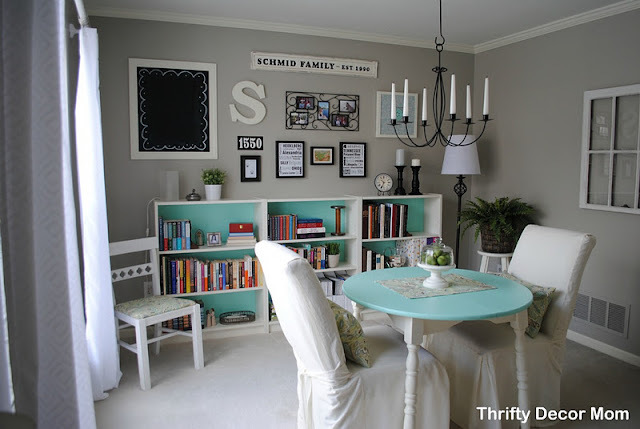 Ok, you need to hop on over to Thrifty Decor Mom to appreciate this room makeover. Seriously, it's like an entirely different place! I just can't get over the aqua and white bookcases! Love them! I know I told you I wouldn't show you anymore of my office makeover until I was finished, but I caught a bad cold last weekend that I am still nursing, so progress is going a little slower than I had hoped. So here is a sneak peek at a project I finished tonight! Great features! I need to start up my feature Fridays again. I love that purple dresser and the room makeover. Amazing talent out there! I love the idea of turning a dresser into a console! Looking forward to your office makeover! Katie, Katie, Katie!!! Love your colorful picks. Good job you guys! Thank you for the feature, I am so glad you picked me because I found your blog :-), I'm your newest follower. These projects are amazing! Thanks so much for featuring my dresser, I'm really thrilled. Thanks so much for featuring my dresser! I really appreciate it and am glad you like it. Glad to have found your blog, you have some great things going on here! Thank you Thank you Thank you for featuring my dresser Katie! That is so sweet of you! I'm excited to follow you. You have a great blog!